Looking for something special in your next set of powered PA speakers? 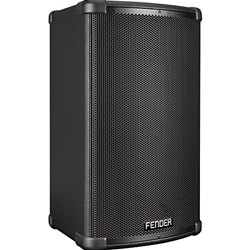 Fender has set the bar at a new height with the well-priced Fender Fighter 12" Powered PA Speaker. You get 1,100W Class D amplification through a 12" subwoofer and 1" titanium horn-loaded compression driver, two mic/line inputs plus an Aux In, bass and treble EQ plus input gain control on each channel, Bluetooth connectivity for streaming audio, and an XLR throughput for daisy-chaining. The Fighter Powered PA speaker features a dual tuned-port system for extended bass response and a dynamic limiting circuit that monitors headroom to help prevent distortion. All this amazing functionality is housed in a lightweight, rugged wood cabinet with reinforced corners, a protective perforated steel grille, and vinyl covering â€” with dual rear handles for easy transport and an integrated 35mm pole socket.